TITANIC IMAGES HAS JUST REACHED OVER 100 000 HITS! Welcome to my Titanic Images page, one of the largest collections of pictures from the Motion Picture "Titanic" on the web (currently around 256 images!). Feel free to take any of these pictures for your own personal use without asking by copying the file to your hard disk. Please do not just copy and use the image location. APPLY FOR THE NEW WEB AWARD...ALL PAGE TOPICS WELCOME! 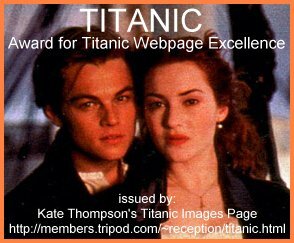 If you have a page about Titanic and want to win the above award (click on it to see the larger version) simply email me and send me your homepage and email addresses as well as a description of no more than 25 words describing your site. Click here to get paid for owning a web page. No catches! 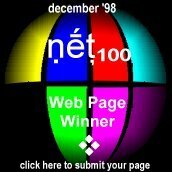 (Please re-submit your name if you joined before March 16th, 1998! NB: As a lot of these pictures are taken from other pages on the internet, it may be difficult to connect to some of them as some sites are very busy. Just keep trying! If you would like individual questions answered..please email me instead of placing them in the guestbook.